One of my husband’s best friends, Sergio, wrote a Favorites Series guest post for this blog in 2013. In it, he mentions that, early in their relationship, he and his wife (then girlfriend) decided to read each other’s favorite book as a way to get to know each other better. She read his favorite, All the King’s Men; he read her favorite, The Red Tent. I’m not sure the masculine/feminine contrast between two books could be more resounding. All the King’s Men won the Pulitzer Prize for fiction in 1947. It’s about the political rise (and simultaneous idealistic/moralistic fall) of a back-country Southern lawyer, based on Louisiana’s Huey Long. The Red Tent is told from the first-person perspective of Dinah, who is Jacob’s daughter and makes a cameo in The Book of Genesis. The book reveals the world of the red tent—the place where women had to go while menstruating or giving birth. As it turns out, neither was a huge fan of the other’s favorite book (in fact, Sergio’s wife hated All the King’s Men and could barely finish it). People may accuse me of sexism, but I would argue that Sergio and his wife’s read-my-favorite-book exercise illustrates that there are “man books” and “woman books” (but I don’t think all books fall into one of those categories; there are gender-neutral books, too). The Red Tent, for example, is a book that I would characterize as strikingly feminine (but not at all girly). It celebrates relationships among women and recognizes women’s oft-overlooked historical significance. I know many strong and independent women who love this book . . . but I’ve never heard a man sing its praises. That’s not to say that men can’t like it or appreciate it; I just have a feeling most men would have trouble relating to it in the way that women do. Anita Diamant, the author of The Red Tent, writes good, strong “woman books.” They are books that celebrate female friendship and are packed with intelligent female characters. 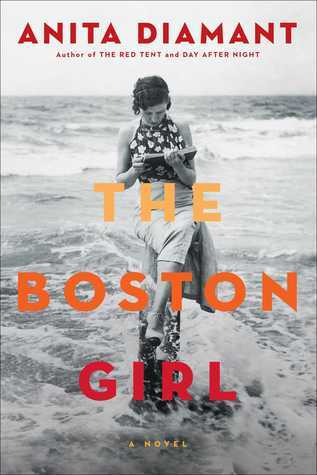 Her newest novel, The Boston Girl, shares The Red Tent’s feminine spirit, and it is a book that, like The Red Tent, I think women would relate to and appreciate more than men. The book is told as the first-person soliloquys of Addie Baum to her granddaughter, who is interviewing her about her life. Addie’s granddaughter wants to know how Addie got to be the woman she is today. “Today” is 1985, when Addie is 85, but the book primarily focuses on her younger years—from 1915 to 1931. The vibe of this book is very similar to the early chapters of The Ice Cream Queen of Orchard Street. Addie is a similar protagonist—she is smart and a little scrappy. She is the daughter of recently immigrated Russian Jews, and her family of five shares a shabby one-bedroom apartment. Her two older sisters are forced to work from an early age, but Addie goes to school, where she thrives. She is a good student who loves learning, and she is curious and hard-working. Her father is quiet and fervently religious; her mother is naggy, mean, and chronically unhappy. In 1915, Addie begins going to the Salem Street Settlement House (sneaking out behind her mother’s back, of course), where she joins a reading club for girls her age. At the settlement house, she finds a loving and supportive family of women, who open her eyes to more modern ideas (pants!). Money is power (so a woman should always make her own). Women are smart and strong and capable, and they should never let men tell them otherwise. There is power in numbers (and women should bond together to protect the weak or disadvantaged). Kindness is of the utmost importance. The book details tragedies (deaths during the flu pandemic of 1918, her sister’s suicide) and joys (births of her nephews, falling in love). The constant through all of the good times and the bad are Addie’s lifelong friends from the settlement house. This is a short and breezy read with likable characters. But, as you may have gleaned from my description, it’s a little over-the-top when it comes to girl power and the joys of female friendship (there’s not one bad, gossipy, mean-spirited seed among them). But the message is strong and good. The book is a celebration of hard-working, forward-thinking women in the early twentieth century—women who forged the way for today’s independent feminists. Who should read it: Like Diamant’s The Red Tent, this is a book that women would appreciate and relate to more than men. In particular, I would recommend it to Shana (i.e., people who loved The Ice Cream Queen of Orchard Street and who would be sold by the first paragraph of this book’s jacket blurb, which reads: “an unforgettable novel about family, friendship, and feminism told through the eyes of a young Jewish woman growing up in the North End of Boston in the early twentieth century”). This entry was posted in Rating: 3/5 and tagged Anita Diamant, Book review, Book Reviews, Books, The Boston Girl, The Red Tent. Bookmark the permalink. I agree with your 3/5. I liked it and it was certainly a quick and easy read but I would recommend The Ice Cream Queen of Orchard Street over this one. Addie Baum was lovely but a bit too perfect (yes, she’s bad with men but in the most innocent way). I might bump it up to a 3.5 just for the numerous Smith references! Glad you liked it. I absolutely agree that Ice Cream Queen is a better book. But it’s also more of a time commitment.